For either the Beatles or John Lennon completist, this rare acetate will undoubtedly pique interest. 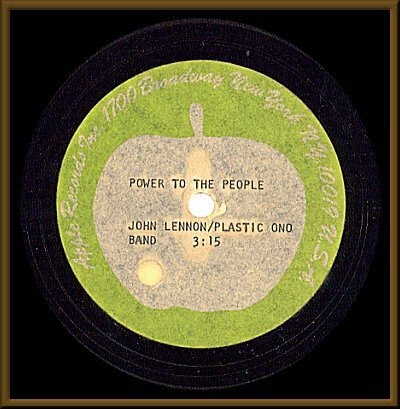 In the single's original form, Yoko Ono's "Open Your Box" was to be the flip to Lennon's "Power to the People." A tad skittish about the song title and content ("Open your box, open your trousers...open your legs") record execs pushed for the more acceptible B-side, "Touch Me." The initial pairing never made it past this acetate, and "Open Your Box" was promptly shelved. Not until the extensive 'Ono Box' would the general public hear the tune. Attractive Apple label display their information readily, and the sound on this acetate more than warrants Near Mint. Light surface lines present but not audible. .